Touch Screen Karaoke Jukebox machine, hire Perth’s most popular digital jukebox with 32″ screen, twin speakers, wireless mics and using Hi Def Graphics. Karaoke machines don’t come any better. These spectacular jukeboxes and karaoke machines are only available from Mega-Soundz, they can not be hired from any other operator. GET THE BIG WOW FACTOR FOR YOUR NEXT KARAOKE/MUSIC PARTY. All karaoke and music jukeboxes come loaded with the biggest and best song selections of both karaoke and music videos from all decades as well as all the Latest Hits and are updated weekly with latest chart releases. 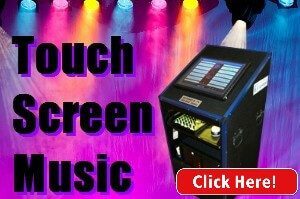 Touch Screen Karaoke Jukebox With Music Videos-PERTH’S MOST POPULAR MACHINE. Rockbox Touch Screen Music Rental Jukebox-NO KARAOKE JUKEBOX. Keith 0431-530-141 8AM-7PM 7 Days A Week. Bev 0431-530-191 8.AM-7PM 7 Days A Week. Office 9250 5195 9AM-5PM Monday-Friday. In addition, we also have twin and single Slushie machine hire from only $119 with a jukebox(Best Price In Perth).And for that extra touch, you can hire the services of our resident Dj Eddie for all your karaoke, music and video needs. We cover all of the Perth area for your next small, large, Corporate or home party event. With free delivery of jukeboxes to most areas of Perth, you can’t go wrong with a Mega-Jukebox and Mega-Service. Check out all our great reviews and Pictures of our high quality setups around Perth and you will see why we are the No.1 choice for jukebox Hire in Perth. 19″ TOUCH SCREEN MONITOR 2 HQ SPEAKERS 2 EFFECTS LIGHTS. LARGE 32″ SINGER’S TV LEADS FOR IPOD / PHONE CONNECTIVITY. 2 WIRELESS MICS-LATEST 2.4GHZ INTERFERENCE FREE SINGING. AWESOME LIST OF KARAOKE AND MUSIC VIDEO SELECTIONS. WHAT MAKES OUR JUKEBOXES THE BEST HIRE FOR YOUR NEXT PARTY IN PERTH ? Kirsten Nedlands ….. We all had such a good night definitley use your karaoke machine for our next party. Kerryl Leeming ……Really good karaoke jukebox machine to use highly recommend it. Jacqui Cotteslowe …. Awesome night karaoke was a hit with everyone best jukebox we have used. Samantha Coolbelup ……karaoke and slushies was a great setup both worked perfectly. Kiara Clarkson … Thanks guys karaoke jukebox machine was excellent all the latest songs were a bonus. Coles • David Jones • UWA • Bankwest • Ace Cinemas • Rio Tinto • Bunnings • Crown Perth • Aspire College • Polytecnic West • Rotary Club • Corporate Theatre • Shire Of Chittering • West Pac • Joondalup Health Campus • Safe Places For Children • Blue Room Theatre • Crosslinks • Intework • St Marys School • Wealth Plus • Irish Club • Hog’s Breath • PMH • Carmel School • Cutting Board • Eye Surgery Foundation • Water Corporation • Ronald McDonald Charities • SBS • K Mart • Good Guys • Parliament House and many more !! Is your business looking for the ultimate karaoke Jukebox Hire? Our versatile jukeboxes are great for corporate karaoke or backyard parties with their superior sound and functionality. All the karaoke jukeboxes have 32″ tv as standard but can be upgraded to 42″, 55″ or 80″ Screen and projector. Why are we always so busy? Customer satisfaction = repeat bookings and referrals. Join our list of regular clients, get your next jukebox from the most reliable hire people in Perth and make it an occasion to remember for all the right reasons. Free Delivery To Most Areas Of Perth For Karaoke / Jukebox Hire !! Gig Rig Full Size Computer Based Karaoke Jukebox-IDEAL FOR VENUES, PUBS, CLUBS. If you require any additional information on our services, DJ Hire, Party Hire, Jukeboxes, Party Lights, Slushie Machines, PA Equipment etc please go to our contacts page and we will be pleased to answer all your questions you may have about our products. As Always NO Surcharges On Public Holidays, Great Prices And Service Every Day. The Best Jukebox Machines For 2019.